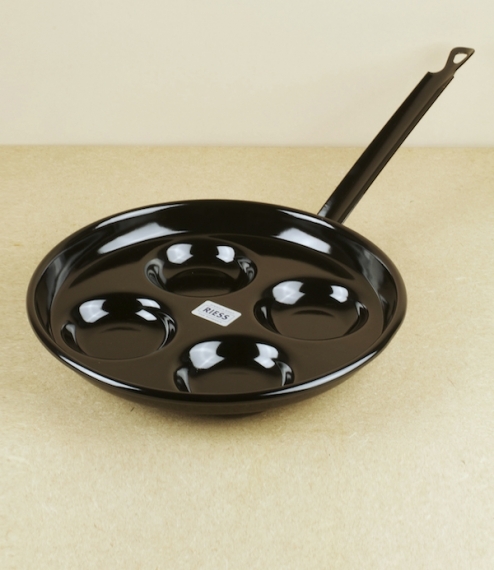 A pressed steel and vitreous enamel pan with four shallow circular depressions for the perfect cooking of fried or shallow poached eggs. From the workshops of the Riess enamel-works in Ybbsitz, Austria, a company who powered by their own hydroelectric plants, and with an enlightened social policy might be considered a model for twenty first century sustainable industry. Having a steel core the pan is suitable for use on any heat source, including induction. Measures approximately 26cm across the pan and 49cm in total length.